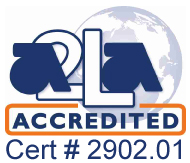 Rainin® pipettes are known for their high standards. Rainin® pipettes - including the LTS™, EDP, and XLS lines, are meticulously crafted for the most ergonomic experience. The ergonomic designs reduce strain and fatigue on operators, allowing for continuous and accurate pipetting throughout the entire day. Simultaneously comfortable and precise, our wide range of Rainin® pipettes provide an ergonomic solution to every pipetting need. If you're looking for a traditional shaft lightweight and durable pipettes with easy tip mounting we recommend CAPP®, Eppendorf®, Biohit®, and AccuPet® pipettes. Rainin® Pipet-Lite line introducing magnetic assist. The magnetic assist technology ensures gentle operation, significantly reducing the risk of RSI. By enabling the use of lighter springs and low-drag seals to reduce the force needed from the operator, the Pipet-Lite allows the operator to find and the zero position prior to aspiration, guaranteeing consistent accuracy and reproducibility. Quit overpaying for Rainin® Brand LTS™ Tips! You shouldn't be forced to pay extremely high prices and deal with lengthy backorders from Rainin®. Ask for your free sample of our Pipette.com 100% LTS™ compatible tips today! We offer bulk bags, reloads, racked, racked sterile, filtered, and low retention options. You can view them all here: Pipette.com LTS™ compatible tips. Rainin’s Pipet-Lite™ XLS™ multichannel pipettes with RFID assure top performance thanks to top quality good ergonomics and ease of use. With the innovative LTS® LiteTouch-System these pipettes also ensure an absolutely consistent sample pick-up on all channels. 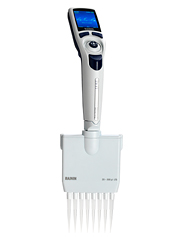 New multichannel E4™ XLS™ electronic pipette. Eliminates user-based variance and ensures maximum precision. LTS® LiteTouch-System for consistent sample pickup and adjustable spacing (adjustable spacing pipettes only) for use with a wide variety of tube and plate formats. New E4™ XLS™ electronic pipette with LTS®. Easy navigation and joystick controls. Eliminates user-based variance and ensures maximum precision. For any application - from pipetting to dispensing mixing and titrating. Loaded with modes and features and a long-lasting battery. Rainin EDP3 Electronic Pipettes LTS® and Standard shafts- see item description. Includes Li-ion battery- wall charger or rapid charging stand sold separately. Increase your productivity with the Pipet-Lite™ Adjustable Spacer – the world’s only manual multichannel pipette with adjustable spacing. Ideal for routine work in Genomic and Proteomic Tissue culture and Cell culture applications. This pipette can change the format spacing from 24-well to 96-well with just a twist! Increase your productivity with the Pipet-Lite™ XLS™ Adjustable Spacer, the world’s only manual multichannel pipettes with adjustable spacing. Ideal for routine work in Genomic and Proteomic Tissue culture and Cell culture applications. This pipette can change the format spacing from 24-well to 96-well with just a twist! EDP Plus has a full-numeric keyboard for rapid settings. Interchangeable liquid ends up to 2000 uL. Volume ranges from 0.5 uL to 10 mL. Uses traditional conical tips. EDP-Plus Multichannel is an electronic 8-, 12-, 24-channel and 2x8 16-channel pipette. LTS for leak-free sealing first time, every time. Consistent sample loading without o-rings. Increased productivity. 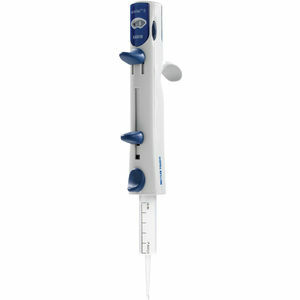 AutoRep M is an electronic repeating pipette. Continuously-adjustable volumes 1 uL to 50 mL. Reduces repetitive stress injuries. Three modes for flexibility. Automatic tip volume recognition with Encode tips. Includes battery pack, recharging base, and AC adapter. 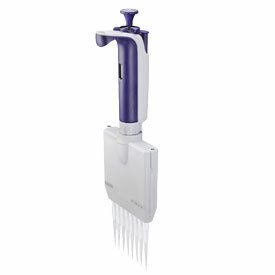 Pos-D Positive Displacement Pipette is a positive-displacement pipette with ergonomic benefits. Made in USA. Eliminates aerosol contamination. Pre-assembled capillaries & pistons in racks eliminate sample carryover, isolate samples from pipette body. 1 - 1000 uL.